Gymnastics is an activity of ancient origins and modern tensions. Most large and medium size cities and towns have a private gymnastics school or offer gymnastics activities via a park district, public school, Turners, Sokol, or YMCA. Media attention toward gymnastics has continued to grow, making gymnastics one of the top television-audience draws. I would like to organize the benefits and limitations of gymnastics in several categories for ease of understanding: (a) physical, (b) psycho-social, and (c) miscellaneous. I would like to balance my treatment of benefits with appropriate discussion of some of the limitations of gymnastics participation. In this way, I hope to provide an even treatment of gymnastics so that parents, gymnasts, and coaches may better understand what gymnastics can and cannot do. Anaerobic means “without oxygen.” Gymnasts tend to have middling levels of aerobic (with oxygen) capacity. However, gymnasts are among the strongest and most flexible of all athletes. Gymnastics performances usually last under 90 seconds. The level of intensity of the activities is too high for long-term performance such as seen in endurance sport long duration events like the marathon. Most sports are anaerobic in nature. Only the long term endurance sports such as cycling, swimming, and running are largely aerobic. Gymnastics is an “acyclic” sport which means that the same movements are not repeated over and over. There are numerous benefits to cyclic, long-term endurance sports but variety is generally not one of them. One of the major benefits of gymnastics activity is that it subjects the gymnast’s body to a wide variety of stimuli. Repeating the same movement patterns over and over has recently been questioned. And, the generally assumed superiority of aerobic training has been shown to be illusory for many areas of fitness, particularly with regard to weight loss. Gymnasts are strong in what is termed “relative strength”. Gymnasts demonstrate their strength by being able to move their bodies through a myriad of positions. Their strength is high when expressed relative to their body weight. “Absolute strength” is the term sometimes applied to strength that is expressed by moving some object or opponent. For example, football lineman and shot putters have large absolute strength while gymnasts and martial artists have large relative strength. One of the major determinants of absolute strength is physical size. Large people tend to be strong in absolute terms, while smaller people are less strong. Strength is one of the major redeeming characteristics of gymnastics. Gymnasts tend to develop upper body strength more than many other sports. Gymnastics emphasizes flexibility due to the need for gymnasts to adopt certain specific positions in order to perform skills. The flexibility demands of gymnastics are probably the most significant and unique aspects of gymnastics that serves to separate gymnastics from most other sports. It is believed that flexibility can be an effective aid to the reduction of injury, preventing athletes from forcing a limb to an injurious range of motion. Flexibility can also be overdone when a gymnast relies on an increased range of motion in inappropriate positions, particularly the spine. However, the research on gymnastics’ contribution to spine disorders and disc degeneration has been mixed. Care should be taken to ensure that gymnasts develop flexibility in appropriate postures, and that appropriate and planned progressions are used in developing new ranges of motion. Gymnastics has an entire event for women devoted to the concept of balance – the balance beam. The men also have an event that requires extraordinary balance abilities – pommel horse. 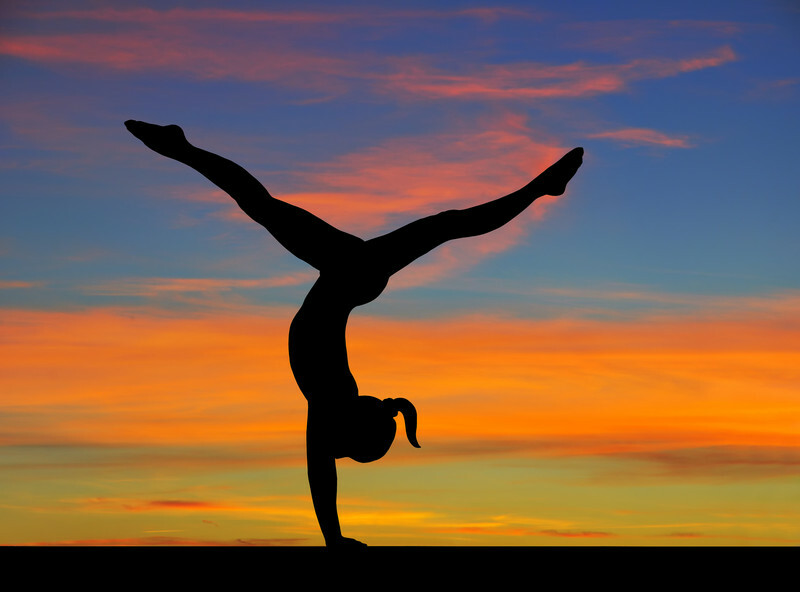 Of course, handstands are probably the single most recognized balance skills. The still rings in men’s gymnastics is an underrated balance event which requires the gymnast to continuously keep the movable rings under himself. Gymnasts learn to balance on their feet and their hands. Interestingly, gymnasts tend to develop a higher tolerance for imbalance or disturbances to their balance. Gymnasts do not react with as large a “startle response” to sudden imbalances as non-gymnasts. This probably means that gymnasts can tolerate larger disturbances to their posture because they have become more familiar with these positions and do not consider them to be such a threat. 5. Gymnasts learn early to fall without injuring themselves. Because gymnastics is performed on mats, the gymnast learns to fall and roll to spread the forces of impact over a larger area and time. Considerable effort is expended in the early teaching of gymnasts to roll – partly as a skill in itself and partly as a prerequisite to other skills. Learning to fall helps the gymnast avoid injury. Fall-training can help prevent injuries in most sports. Gymnasts acquire a very “cat-like” ability to right themselves and to fall without being hurt. 6. Gymnasts are among the smallest and lightest of athletes. Gymnastics is somewhat unique in that it provides competitive opportunities for the smallest and lightest athletes. Many sports are clearly biased to prefer athletes who are tall and/or big. Sports that cater to smaller athletes usually involve weight classes which limit the number of small athletes who can participate (i.e., one per team). Smallness is actually beneficial for gymnasts in performing better and avoiding injury. Being small and light can be taken to extremes that are clearly unhealthy. The issue of eating disorders and the unbridled attempt to reduce body weight at all costs has plagued some gymnasts. However, gymnastics is not alone in this problem. Moreover, gymnastics is neither necessary nor sufficient for the development of eating disorders. In eating disorders, there are a constellation of factors that contribute to a behavior, but these can be classified into 3 areas: (a) predisposing, (b) enabling, and (c) reinforcing. Predisposing factors might be: low self esteem, neuroticism, narcissism, obsessive/compulsive behavior, depression, and a predominantly external locus of control. These do not meet the criteria for causation, however. Excessive exercise and athletic participation may be enabling factors for the expression of these negative personality traits and not a cause of these behaviors. Daily exposure to the general milieu of athletics, coaches, parents, etc. may provide the reinforcing factors necessary to sustain the negative personality traits. The distinction between predisposing, enabling, and reinforcing factors versus causative factors is essential to understanding disordered eating and the role that gymnastics may play. Many sports that involve female athletes and exercisers also suffer disordered eating problems. And, disordered eating is prevalent in many sub-groups of females from high school students to medical students. Finally, disordered eating is also becoming more prevalent among male athletes. Although there are numerous sources of information on injury in sport, the Consumer Product Safety Commission is one of the best. Table 1 shows the number of people visiting hospital emergency rooms in 1997. Gymnastics ranks 24th in the list, placing it near the middle of surveyed activities. Gymnastics ranks somewhat above average in hospital admissions. Of course, this information represents all of gymnastics, including injuries that occur in the yard while doing cartwheels or from striking the furniture while performing in the living room. In competitive gymnastics, particularly the highest levels, the injury rate is higher. Unfortunately, there is little reliable information on the national extent of the highest competitive level injuries. Those competitive gymnasts who are injured severely enough to require an emergency room visit are likely represented in Table 1. However, those who are injured less severely may never visit an emergency room and deal with treatment via simple first-aid or a visit to their personal physician. Of course, without a “denominator,” we cannot know the rate of gymnastics injury. In order to fully understand gymnastics injury, we need to know the number of injuries that occur relative to the number of participants who are exposed to a potential injury. There are a number of figures indicating the total participants in gymnastics that are widely varying from approximately 50 thousand to nearly a million. Most research on gymnastics injury at the highest competitive levels has shown that injury rates are comparable to football and wrestling. Any number of reasons can be cited for the relatively high injury rate of gymnasts at the highest levels. Certainly, these athletes are more visible than athletes at lower levels, are studied more frequently, and are also subjected to higher numbers of repetitions while performing the most difficult skills. The gymnastics community has reacted strongly to the problem of injury by both regulatory and environmental means. When skills are identified as being particularly injury prone, these skills are subject to much greater scrutiny and are sometimes restricted in their use. Restrictions occurred with the Yurchenko vault and 11/2 forward somersault. Moreover, the increasing use of foam pits, soft landing mats, and attention to conditioning have done much to keep pace with the “space-age” skills of the modern gymnast. Surely, more work needs to be done in this area, with this author particularly committed to rooting out the issues related to injury, studying them, and producing effective means of prevention. Gymnasts tend to do very well in school. The College Gymnastics Association has kept track of men’s gymnastics teams’ average GPAs. List 2 shows the top 10 GPAs by rank in men’s gymnastics. There are a number of ways to interpret GPA information. Particularly relevant are the athletes’ academic majors. Short of this complete information, the GPA data shown below still indicates that gymnasts are serious about their education. Gymnastics is a complex sport with many dramatic and subtle nuances. Educational experiences in gymnastics reach from physics to the appreciation of cultural diversity. One of the most important benefits of gymnastics activity is that the gymnast can experience a variety of things rather than just read about them. For example, physicists discuss the principle of conservation of angular momentum while the gymnast experiences it. The physics teacher may discuss moment of inertia and its relation to angular momentum, but the gymnast can see and feel it while performing skills. The richness of such experiences goes far beyond reading about them in a book. Recently, a National Science Foundation grant has used gymnastics as a means of teaching fundamental physics to students. Teamwork, Sportsmanship, Fair Play, Dedication, and more. Gymnastics shares with other sports the opportunity to learn about teamwork, sportsmanship, fair play, dedication, and so forth. Sometimes these character traits may be considered old-fashioned, but gymnastics does provide a terrific opportunity for teaching these characteristics. Because gymnastics is so very difficult to perform, the learning time is long when compared to most sports. The long time required to attain mastery of the fundamental skills requires patience, dedication, perseverance, and planning. Gymnastics helps people learn to work hard for objectives that can take years to achieve. In the modern world of quick-fixes, instant communication, instant hamburgers, and instant entertainment, there still needs to be a place for young people to develop their character. Although it may sound corny, gymnastics is a perfect activity for such development. Gymnasts of even modest ability can compete in local, state, and regional level competitions. These competitions afford the opportunity for travel, meeting people of varied and diverse backgrounds, and seeing places that would normally be bypassed. The recent dramatic increase in participation by gymnasts in “General Gymnastics” serves to emphasize a newly developed outlet for training and competition that does not emphasize Olympic-level pursuits. Group exhibition-type displays involving tumbling, acrosports, balance, and music can be an exciting and rewarding activity for young gymnasts. The General Gymnastics area of USA Gymnastics has developed competitions (called TeamGymn competitions) for these displays, and the groups travel both nationally and internationally. Education is perhaps the most important part of gymnastics. When an activity can be naturally orchestrated to provide participants with unique and valuable experiences, it serves the participants more than any book, television show, or website. Gymnastics provides a unique and valuable social education and experience. The most successful female gymnasts pursue success rather than avoid failure, and have the highest self-esteem when compared to other members of the senior national team. Although pursuit of success versus avoidance of failure may seem like a subtle difference between groups of gymnasts, pursuit of success indicates a “healthier” outlook on competition. High self esteem indicates that the gymnasts are pleased with themselves, can function independently, and are self-reliant. The quotation below was unsolicited from a parent of a gymnast. The quotation appeared on the USA Gymnastics WEB site. “Not only do the gymnast [sic] acquire the ability to focus on an activity while blocking out what’s going on around them, my daughter learned valuable time management skills that carried over into all her activities and school. The focusing ability helped her at a musical competition when a quartet started in the next room at a totally different tempo and loud enough so that she had a difficult time hearing her accompanies [sic]. The adjudicator [sic] came out and congratulated her on her ability to continue her piece the way it was supposed to be instead of letting the other music bother her. The cultural and social identity of the gymnast offers an unambiguous role for the young person. Recent experience with elite track and field has shown that athletes and coaches are acutely aware of the fact that females in track and field are faced with a role conflict by being a “bigger than average” woman in a society that prefers a petite and slender female. Female gymnasts particularly enjoy being among the petite and slender females that are often socially most acceptable. Although gymnasts can be tiny, late maturing, and so forth; the public usually has a misconception about how young gymnasts really are. Moreover, the gymnast’s small size might be a limitation in most sports, while gymnastics allows the petite girl to excel. The male gymnast sometimes faces a misunderstanding relative to the masculinity of the sport, but experience has shown that other athletes realize how difficult gymnastics is and do not question that athleticism of the male gymnast. Drug abuse in gymnastics, while not unknown, is extremely limited. Drug abuse was common in the former Eastern Bloc, particularly East Germany. Drug use and abuse among gymnasts in the West has been extremely limited, and until recently almost unknown. Athletes in many sports have experimented with drugs. Perhaps fortunately, gymnasts do not enhance their performance by the typical anabolic steroids, stimulants, and other drugs that can assist other athletes for a short period. Gymnasts do not require an allout strength or power – but power under control. Gymnasts do not require an all-out endurance – but endurance under control. When a drug interferes with control (as most do), their benefit to gymnasts is highly questionable. Gymnastics has developed a Code of Ethics that is a position statement to which all members of USA Gymnastics must adhere. Gymnastics has done a good job in policing its ranks by banning participation and membership of those people who behave in an unethical manner. At the current time, many former coaches have been banned from participation in USA Gymnastics events due to previous unethical behavior. Gymnastics is a terrific sport for young people. Many people have grown up in and by gymnastics to become doctors, lawyers, teachers, business people, professors, police officers, nurses, scientists, and many others. Gymnastics provides an outstanding way for young people to test their mettle against themselves and others. Gymnastics can provide opportunities for physical development, character development, and education that are hard to find anywhere else.